After transpeptidation, the subsequent translocation of the tRNA residue from the A site to the P site will drag mRNA, but just by two paired nucleotides. As a result, mRNA will move by two nucleotides, instead of triplet, and thus -1 frameshift will occur: e.g., GCA GCA AAC ® GCA GC AAA C... Another case is the so-called overlapping binding of an incoming aminoacyl-tRNA when its anticodon interacts with the triplet of mRNA extending over the next codon. The same Ser-tRNA3 gives an example of such behavior: when lysine codon AAG, followed by leucine codon CUU, is presented in the A site, Ser-tRNA3 can bind to the triplet AGC lapping over the leucine codon. The result of the subsequent translocation will be +1 frameshift: AAG CUU ® AAGC UU.. The tRNA species under consideration (E. coli tRNASer with anticodon GCU) represents a typical "shifty" tRNA capable of producing both - and + frameshifts due to misbinding at the A site. Some structural peculiarity or flexibility of its anticodon is thought to be responsible for this behavior. Since aminoacyl-tRNA misbinding underlies the mechanism considered above, the frameshifting produced by this mechanism can be stimulated by all the same factors that are known to stimulate miscoding (see Section 10.4.4), including aminoglycoside antibiotics, increased Mg2+ or polyamine concentration, distorted ratio of different tRNAs, starvation for an amino acid or shortage of a tRNA species, ribosomal ram-mutations, etc. In particular, the probability of the duplet binding or the overlapping binding increases in the cases when the translating ribosome pauses at the empty A site. Such a situation arises with a "hungry" codon (in the case of starvation for a cognate amino acid), or a rare codon (especially when a cognate minor tRNA is exhausted, for example with tandem rare codons) in the A site. In the absence of a cognate aminoacyl-tRNA, a non-cognate "shifty" tRNA can enter the A site and produce a frameshift. Figure 12.6. Polyamine-induced frameshifting (+1) during translation of the antizyme mRNA. (Reproduced, with minor modifications, from J.F. Atkins & R.F. Gesteland, in "Translational Control", J.W.B. Hershey, M.B. Mathews & N. Sonenberg, eds., p.p. 653-684, CSHL Press, 1996, with permission). Figure 12.7. Frameshifting (+1) during translation of the mRNA encoding for termination factor RF2. (Reproduced, with minor modifications, from R. Weiss & J. Cherry, in "The RNA World", R.F. Gesteland & J.F. Atkins, eds., p.p. 71-89, CSHL Press, 1993, with permission). initiation codon, but then a stop codon UGA encounters. The frameshift at the stop codon is strongly induced by polyamines. Thus, when the polyamine level is low, ribosomes read only the beginning of the mRNA sequence and terminate at the UGA; hence, antizyme is not produced, and ODC lives relatively long supporting the polyamine synthesis. When the polyamine level becomes high, the induced +1 frameshift allows ribosomes to continue translation in the new reading frame and to complete the synthesis of antizyme provoking the ODC degradation. The frameshift sequence of the antizyme mRNA is UCC UGA U. In the case of induction, the anticodon loop of seryl-tRNA in the A site seems to bind quadruplet UCCU, rather than its cognate triplet UCC, and hence the subsequent translocaton by four nucleotides results in setting the triplet GAU, an aspartic acid codon, in the A site. Thus the initial peptide sequence ended by serine is further elongated by aspartic acid and then by all the rest sequence of the antizyme polypeptide. It is interesting that there is a pseudoknot downstream of the frameshift site that stimulates the +1 frameshifting by some unknown way. 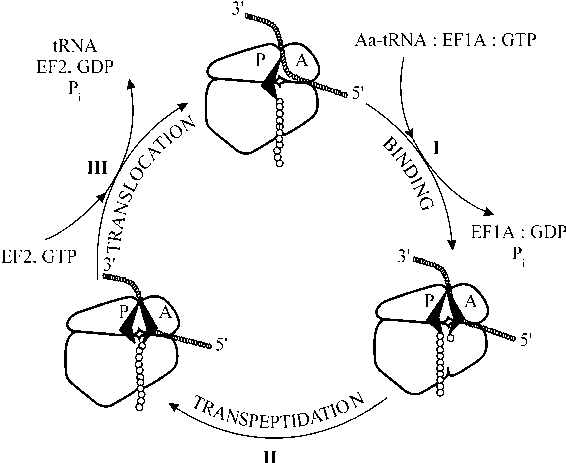 The second mechanism of non-triplet movement of mRNA involves translocation events proper: it is a strand slippage between an anticodon and mRNA during translocation. In typical cases, a cognate aminoacyl-tRNA binding takes place in the A site, but after transpeptidation the subsequent translocation of the tRNA residue from the A site to the P site is found to be uncoupled with the codon shift; the tRNA anticodon slides along mRNA or mRNA slides along the anticodon, most often by one nucleotide, thus resulting in -1 or +1 frameshifting, respectively. Such slippage can occur on strings of purine or pyrimidine nucleotides, during translocation of tRNA residues with corresponding all-pyrimidine or all-purine anticodons. The simplest examples are the slippage between tRNALys with anticodon U*UU and an oligo(A) sequence, or between tRNAPhe with anticodon GAA and an oligo(U) string in mRNA; both +1 and n1 frameshifts are possible. The examples of the slippage of tRNALeu with anticodon GAG on the mRNA sequence CUUU (CUUU ® CUUU: +1 shift), tRNALeu with anticodon U*AA on the sequence UUUA (UUUA ® UUUA: n1 shift), tRNAPhe with anticodon GAA on the sequence UUUC (UUUC ® UUUC: n1 shift), tRNAAsn with anticodon QUU on the sequence AAAC (AAAC ® AAAC: -1 shift), tRNAGly on the sequence GGGU (GGGU ® GGGU: +1 shift), and some others, have been also reported. Figure 12.8. Frameshifting («1) during translation of HIV mRNA (gag-pol junction). (Reproduced from R.B. Weiss, D.M. Dunn, M. Shuh, J.F. Atkins & R.F. Gesteland, New Biologist 1, 159-169, 1989). tRNALeu from UUA to UUU is facilitated by the possibility of the preceding tRNAPhe to slide in the same direction (UUU UUU A..). Another example is the sequence ..A AAA AAC in the RNA of mouse mammary tumor virus: here tRNAAsn slips -1, possibly together with -1 movement of the preceding tRNALys (AAA AAA C..). These observations may suggest that the slippage takes place at some intermediate stage of translocation when the A site tRNA residue and the P site tRNA are partly pulled out from their sites but both retain their bonds with mRNA. The interactions with mRNA, however, should be weakened at this stage, thus permitting the slippage. The presence of a stop codon downstream of a slippery codon is also often observed in sequences with high frequency of frameshifting. 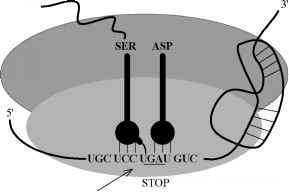 For example, the +1 slippage of tRNALeu from CUU to UUU (see above) becomes especially significant in the sequence CUU UGA C.., resulting in reading the sequence as UUU GAC (LeuAsp) and thus continuing the translation in the new reading frame, instead of termination at the stop codon. It is not clear how a downstream codon can affect the slippage of the A site tRNA residue during translocation. An increased probability of the slippage of the post-translocation state ribosome with the empty A site (if the binding of a termination factor RF after translocation is delayed) cannot be excluded. Figure 12.9. Postulated mechanism for pseudoknot-induced frameshifting. A: First translocation attempt is jammed by pseudoknot structure binding in the 30S "melting site" (a hypothetical mRNA-binding site upstream of the A site responsible for primary unfolding of mRNA): structural barrier. B: Second attempt is successful because both tRNAs have slipped by one nucleotide towards the 5'-end of the mRNA. (Reproduced, with minor modifications, from R. Weiss & J. Cherry, in "The RNA World", R.F. Gesteland & J.F. Atkins, eds., p.p. 71-89, CSHL Press, 1993, with permission). correspondingly, the message consist of two parts: the first, smaller part of the sequence encodes for the N-terminal 25-residue portion of the protein and ends with termination codon UGA; the remainder of the 339-residue protein is encoded by the following sequence that is not in the same frame as the previous part. The reading of the second part of the sequence requires +1 frameshift at the position of the termination codon: tRNALeu slides from CUU to UUU (Fig. 12.7). The frequency of the frameshifting in the above sequence can be as high as 30 % resulting in the production of the proper polypeptide chain (protein RF2) with a reasonable yield. The upstream hexanucleotide string AGGGGG has been shown to be critical for providing such a high efficiency of the frameshifting. It has been demonstrated that the complementary interaction between this polypurine sequence and the 3'-terminal polypyrimidine section of the 16S RNA in the ribosome, similar to the Shine-Dalgarno interaction during initiation of translation (see below, Section 15.2.2), is responsible for enhancing the slippage of the ribosome along the CUUU quadruplet overlapping the stop codon. The frequency of the slippage is regulatable: when the level of RF2 in the cell is sufficient the protein binds to the stop codon UGA in the ribosomal A site and thus terminates translation; no new RF2 is synthesized. Hence, the frequent slippage and thus the synthesis of RF2 occur only under conditions of RF2 shortage. This is an interesting example of a feed-back regulation of the efficiency of translation via a programmed translocation error. Programmed shifts are used also in eukaryotic systems. The best-studied case is the translation of the gag-pol mRNA of retroviruses. The translation of this mRNA can produce either just Pol protein, or Pol-Gag fusion protein which is to be split by a special protease into Pol and Gag. The point is that the mRNA sequences encoding for Pol and Gag are not in the same frame, and the synthesis of the Gag part requires a -1 frameshift at the border of the two sequences. The scheme of the frameshifting during translation of the gag-pol mRNA of HIV-1 is shown in Fig. 12.8. It has been noted that in such cases the sequence immediately downstream from the slippage site can form a stable stem-loop or pseudoknot structure that may be important for increasing the frequency of the frameshift, possibly by creating a structural barrier for mRNA translocaton (Fig. 12.9).